If you have learnt how to trade candlesticks, you must know the engulfing candlestick pattern. Its striking name and visual makes it one of the most popular candlestick pattern. The engulfing candlestick pattern has two candlesticks. The body of the second bar completely engulfs the body of the first bar. It represents a total change of market sentiment. 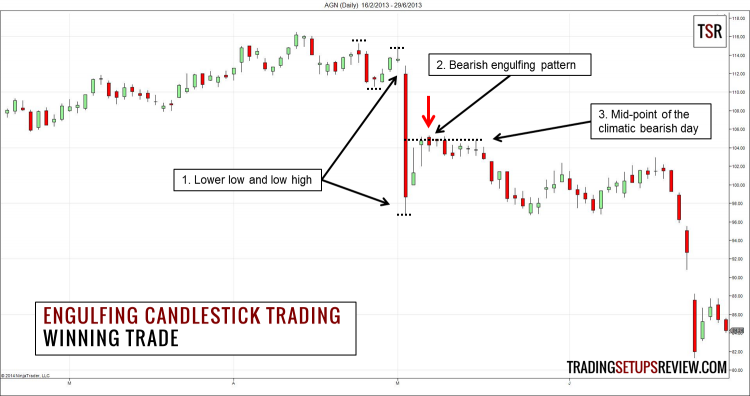 An engulfing candlestick in the right context offers a high probability trading setup. Finding the best context with moving averages and oscillators are reliable trading methods. However, in this review, we will look at a simpler method that uses the concept of market structure to find point us in the right direction. Market structure refers to the relationship of swing highs and lows that lend structure to market trends. This is a daily chart of Allergan (AGN on NYSE). It shows a market plunge that erased months of gains. The lower swing high and low confirmed the beginning of a downwards trend with the climatic bear bar. Prices retraced up immediately after the drastic fall. The bull move stopped as a bearish engulfing candlestick emerged. The bearish engulfing candlestick pattern formed on the mid-point (50% retracement) of the strong bear trend bar which provided resistance. This daily chart of Cardinal Health (CAH on NYSE) shows a bearish engulfing pattern that didn’t follow-through. Technically, there was a set of lower swing high and low. However, in this case, the swings did not push out of the sideways movement of CAH. Hence, the lower high and low structure was not a reliable indicator of a downwards trend. The bearish engulfing candlestick pattern led to a losing short trade, as prices broke out above the trading range. Many trading strategies use engulfing candlestick patterns as a signal for major trend reversals. That is a low probability strategy. However, as we use engulfing patterns for continuation trades here, we have better odds. Many candlestick traders wait for one more candlestick after the engulfing pattern as confirmation. 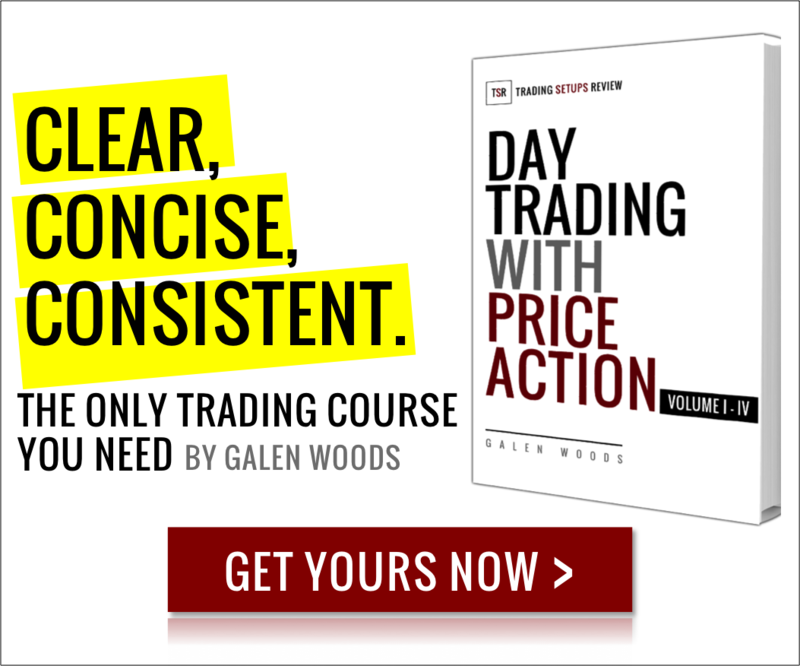 For this trading strategy, you should not wait for confirmation for most trading setups. Waiting for confirmation worsens our reward to risk ratio. If you wait for confirmation, the trading setup is likely invalid due to trading rule 3. Basically, that rule keeps us away from taking trades that have poor reward to risk ratio. Observing swing highs and lows is the simplest way to follow market trends. It builds on the market structure and does not need any trading indicator. While this approach gives some confusing signals during deeper pullbacks, its simplicity is still attractive. Regardless of your trading strategy, paying attention to the market structure will help you filter bad trades. 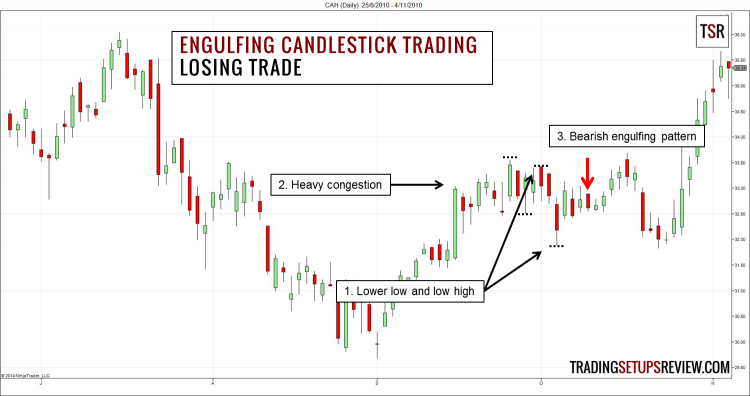 Congested markets might have many engulfing candlestick patterns with no follow-through. Be careful and avoid signals in sideways market. Look for clear swings to avoid congestion. Hone your skills in reading the market structure. It is invaluable in any trading method. What if the candle has wicks? Does it make a difference if the engulfing bar covers only the body and not the wick? Generally, an Engulfing Bar that covers the entire candlestick (body + wicks) is a firmer reversal signal than one that covers only the candle body. Thank for sharing, Do you have any post about stop loss and take profit? I don’t understand how to take profit and stop loss with price action . Thanks! Hi Phuc! Take a look at this article on taking profits and this one on stop-losses. In the losing trade example could you not consider the lower high as a Dark Cloud Cover pattern? Thus signaling the conclusion of the congestion and using it to enter the trade short? I get that retrospective analysis is more straightforward but did a potentially winning trade turn into a loser because that pattern was missed? Yes, you can treat the lower high as a Dark Cloud Cover. But using it as a short entry is not consistent with our strategy here. Here, we need a lower high and lower low to confirm a bearish bias before we look for a a short entry. Using the Dark Cloud Cover as a short entry will be premature according to our approach here.